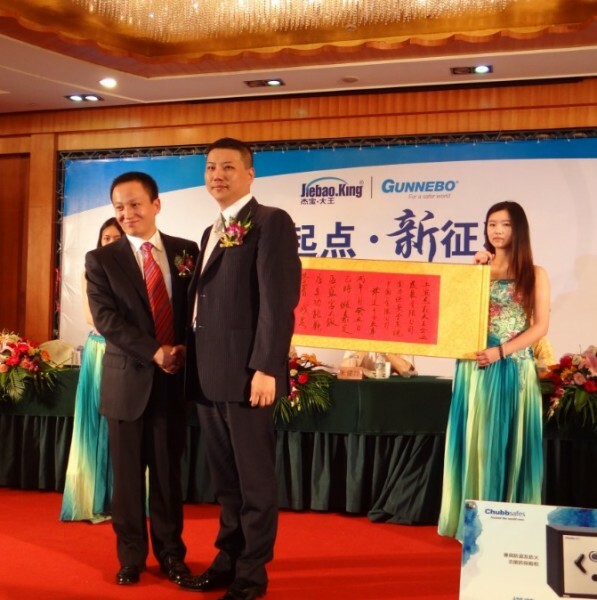 The meeting started with an official ceremony between Jiebao King and Gunnebo China, which was followed by speeches from VIP guests, a product presentation, a demonstration of burglary-resistance and finally product training. The guests showed great interest in Chubbsafes products, and the demonstration displayed how Chubbsafes offers a security level a lot higher than the mainstream safes on the Chinese market. The guests were confident in Chubbsafes’ potential and expressed the intent to promote Chubbsafes products to the market. “After 20 years’ development, Jiebao King has now become a leading company in the China safe industry. It will be win-win cooperation between Jiebao King and Gunnebo. “We believe, through effectively integrating the resources of both parties, we can fully utilize our advantages in the physical security market and meet the requirements from different customers. It will bring business success to both companies, and take Jiebao King to a new level,” said Gu Jie, Chairman and President of Jiebao King. “China has become an important security market in the world. As a company with a more than 200-year history in the security industry, Gunnebo would like to introduce its expertise and experience to the Chinese market, serve its customers and create added value for them. Chubbsafes, founded in 1818, is one of the most well-known safe brands in the world and has witnessed the development and evolution of the worldwide safe industry. It is our honour to announce the partnership with Jiebao King and I believe it is a very good start to launching Chubbsafes into China. With the nationwide channels of Jiebao King, we can provide European graded safes to Chinese customers and fulfill the requirements of the high to premium market segment. We believe the launch will also elevate the safe industry in China,” said Chris Dai, Country Manager of Gunnebo China. Gunnebo China has received its first order from Jiebao King worth KEUR 100. The products will be distributed to shops in July 2012. All the safes being launched in China have passed the CCC certification B2 level (EN 1143-1 Grade I & II ), B3 level (EN 1143-1 Grade III, IV, V) or A2 level (EN 14450 S2).